How do you rate your stay at the Excellence Play Mujeres Resort - from 1 to 5 stars? Six Stars...oh wait...OK 5 stars! What were your favorite things about the Excellence All Inclusive? The Excellence Class, the Food, the friendliness of everyone. Clean, Top Of The Line! What were your least favorite things about the this Mexican resort? Had to leave. Hard to find rafts for the float river, entertainment was the same as last year. Spend everything you have to stay as long as you can. Some restaurants are not open every night so plan ahead so you can visit your favorite. Well, my sister and I went and it is very coupley...but we made friends and did not feel uncomfortable. Most rooms only have a king bed. Excellence Playa Mujeres resort is a five star all inclusive that gets a 97% recommendation rate from previous travelers! That being said this is not a budget all inclusive! If you're looking for a beautiful Mexican resort with great ammenities; a quiet beach with few other resorts nearby - great for long walks; gorgeous grounds with hammocks, cabanas and a lazy river pool; great staff and customer service; good food for an all inclusive with nine restaurants and 24 hour room service (even accomodating food allergies very well); and many types of suites available including swim-out suites. 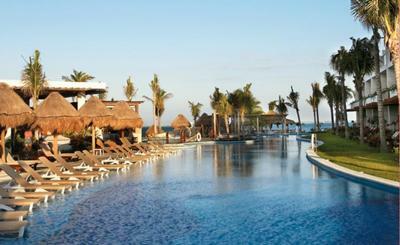 This Mexican all inclusive resort is only a 30 minute drive from Cancun but feels very secluded. It is an adults only all inclusive resort. You can read more reviews, and find Excellence Playa Mujeres resort details at TripAdvisor. Find more Adult Only All Inclusive Romantic Travel Destinations! Join in and write your own page! It's easy to do. How? Simply click here to return to Best All Inclusive Resort Reviews.